The Orphic Egg in the Ancient Greek Orphic tradition is the cosmic egg from which hatched the primordial hermaphroditic deity Phanes/Protogonus (variously equated also with Zeus, Pan, Metis, Eros, Erikepaios and Bromius) who in turn created the other gods. 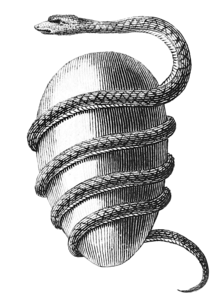 The egg is often depicted with a serpent wound about it. In Greek myth, particularly Orphic thought, Phanes is the golden winged primordial being who was hatched from the shining cosmic egg that was the source of the universe. Called Protogonos (First-Born) and Eros (Love) — being the seed of gods and men — Phanes means "Manifestor" or "Revealer," and is related to the Greek words "light" and "to shine forth" as well as the Latin "Lucifer". Ineffable, hidden, brilliant scion, whose motion is whirring, you scattered the dark mist that lay before your eyes and, flapping your wings, you whirled about, and through this world you brought pure light.